Building Gunpla is only half the battle. Here, we’ve invited Gunpla 101 contributor Mario Lebel to document his process of building a light box on the cheap. Check it out below. 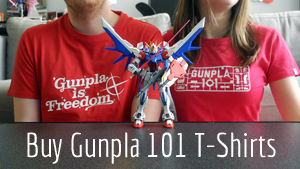 Taking good, quality pictures of your Gunpla can be as challenging as building your kits. There are several different methods of photography available to you. One of my favorites is the use of a light box, a tool designed to provide consistent illumination for photographers. A light box creates a clutter-free area in which to pose your model while also providing proper lighting. By eliminating all distractions, including a backdrop, a light box directs the viewer’s attention to your Gunpla alone. A light box gives you complete control of your lighting which in turn helps you to show off the details of your model. Even without the use of an expensive camera, you can achieve great pictures with the aid of a light box. It’s a great way to step up your model photography, and best of all, it’s easy to make one yourself. A large white paperboard—any large non-transparent paper will do. Three light sources, like desk lamps, clip-on lamps, or flashlights. 1. Assemble your box with the packaging tape. Tape one side closed and leave the other open. You can keep the flaps attached to the rest of the box as they can be used to block any direct light emanating from your lighting sources. This could help prevent any problems later. 2. Use your hobby knife to cut out a large, square hole on three of the four sides of the box. Use your ruler to keep things straight. When completed, you will use the light box on its side in such a way as to have three panels through which the light will enter. One is placed on top and the other two will be located on either side. 3. Once your holes are cut out, cover them with your light diffusers. You have a couple options on the kind of material you can use. You can use a few layers of tracing paper or even transparent gift wrapping paper. Another material, the one I prefer to use, is fabric interfacing. It’s sturdier than the paper and easily affordable. You can find some at your local fabric store. Make sure to measure your box and the sides you will cover before buying your material. Use the packaging tape to secure your diffusing material on the box. You want to fully cover the holes you previously cut out. 4. Next, add a plain background. This is where the large paperboard comes in. Cut it down to the same width of the box. Attach one end to the front of the box and tape the other end at the top, effectively covering two sides of the box (the bottom and the back). When taping the paperboard in place, make sure not to bend it. By giving the board a curvature upwards rather than a hard fold line you eliminate any edges or corners that might show up in the backdrop. This will help keep the focus entirely on your Gunpla. 5. Find an area in which to do you photography and set up your lighting sources around the light box. I use a desk lamp for the top light source and two LED flashlights for the sides. It’s not ideal, as I have to prop up the flashlights so they provide proper lighting. I plan on buying two clip lamps so that I can attach them to my desk and gain better control of my light sources. All done! Now you’re free to take pictures any way you want. If you don’t have a steady hand, use a tripod, or set your camera on a flat surface in front of the light box. If that’s not an option, try to keep your elbows tucked in, and your arms close to your torso. This will help to stabilize your camera and avoid blurry pictures—especially with close-up shots. One of the most convenient things about the DIY light box is that it can be stored easily. It’s portable, so you can set it up anywhere you want. Since the box is made out of cardboard, it flattens out easily. It’s not nearly as cumbersome or as difficult to store as you might have thought. The best thing is that since your paperboard is cut to fit inside the box when it’s assembled, it also fits inside the box when it’s flattened. If you’ve built a light box of your own and have tips to share, please do so in the comments. We’d also like to see any Gunpla pictures you took while using a light box!